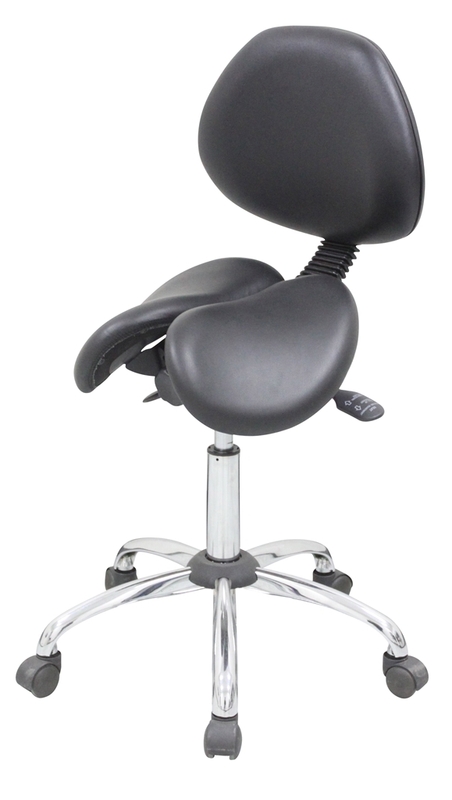 Highly adjustable leather saddle chair with backrest for demanding work tasks. Patented split-seat design suitable men and women. For medical, veterinary, dental, laboratory, and office environments. New! 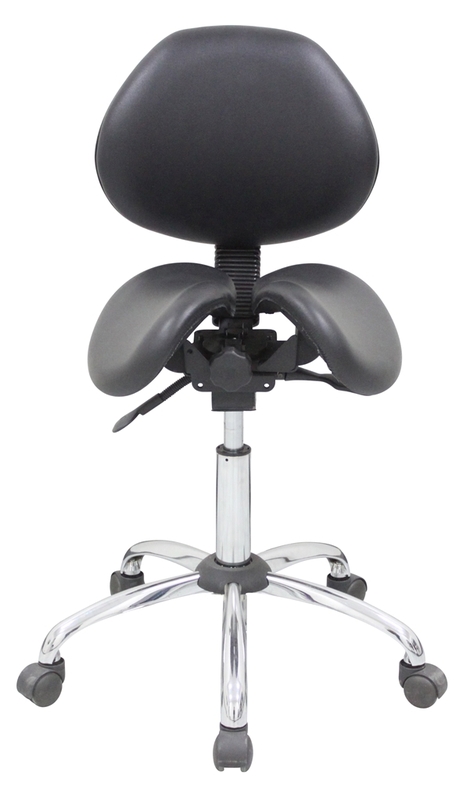 Highly adjustable saddle chair with backrest for demanding work tasks. 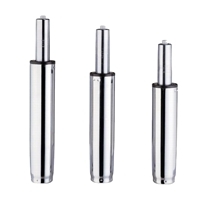 Suitable for medical, veterinary, dental, and laboratory applications. Ideal for active office environments, drafting height tables and sit-stand desks. Patented adjustable split-seat accommodates both male and female anatomy. Adjustable split-seat design improves ventilation and relieves pressures for comfort in demanding work tasks. Saddle width and angle are adjustable for personalized comfort. Kanewell saddle chairs are a value-priced alternative to the original Finnish Salli Multiadjuster. Adjustments and features are similar, however the center gap is more narrow, there is less contour under the hips and thighs, there are fewer options and accessories, and the warranty is less generous. Heavy duty steel seat plate covered with high quality contouring foam. Patented adjustable seat width and center gap for a custom fit. Forward-backward seat tilt for comfort. Genuine top-grain leather upholstery meets California TB 117 flammability requirements. Pneumatic cylinder for seat height adjustment. Choose short, medium, or tall height range. Choose large 60mm casters for easy maneuverability, or optional stationary glides. The backrest will NOT support your back when you are in a normal working posture. Saddle sitting is not like sitting in a conventional chair. 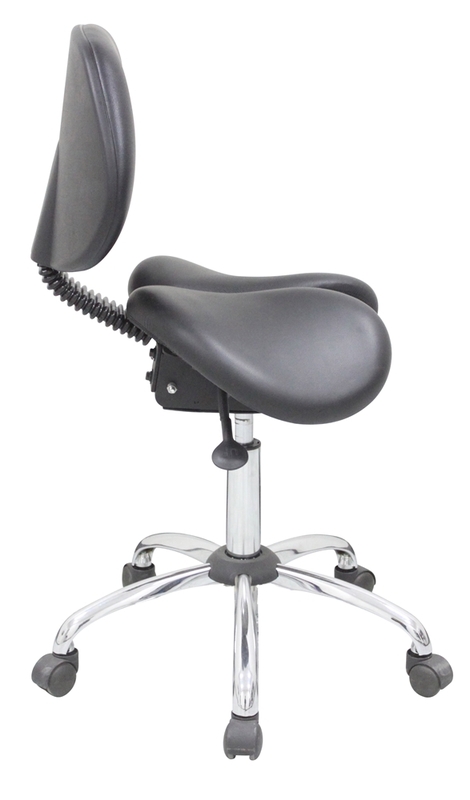 A saddle stool supports your torso center-of-mass forward of your hips. Backrests only work when your torso center-of-mass is behind your hips. So think of this backrest as an intermittent "rest" for those moments when you take a break from your active hand tasks. Also, the quickest, easiest, and safest way to get on a saddle seat is from the back. You won't be able to do this if there is a backrest on your saddle. Read more about Why saddle seats don't need backrests. Genuine Kanewell Saddle Stool pneumatic chair cylinders. Large 60 mm diameter chair caster rolls more easily than smaller standard chair casters. Available with hard tread for carpeted floors or soft tread for hardwood and tile floors. No hood. Recommended for Kanewell Saddle Stool. Kanewell Saddle Chairs are VERY firm. Much firmer than conventional seating. If you expect cushy softness in a chair, you will be disappointed. Kanewell Saddle Chairs are therapeutic and become comfortable over time as the body stretches and tones its way toward better health. NOTE: Very fit and flexible people are often comfortable in a Kanewell Saddle Chair immediately. If you are deconditioned and stiff, you will likely need more time to accommodate the saddle. Low 4'9" to 5'4" 21" - 26"
Medium 4'11" to 5'11" 22.5" - 30"
Tall 5'10" and over 27" - 37"
Body height recommendations are approximate and vary with body proportion, height of shoes, riding style, etc. Actual seat heights vary depending upon caster size, chair mechanism options, base style, etc. Kanewell Saddle Chairs support body weights up to 250 pounds. For standard use, the manufacturer warrants to the original purchaser that the chair shall be free from defects in material and workmanship for 3 years. Normal wear or abuse of upholstery is not covered. This warranty is void if the product has been defaced, changed, or tampered with or improperly used or installed or if the claim arises from damage or loss during shipment. All other warranties express or implied, whether arising by virtue of statue or otherwise are excluded. For continuous 24-hour use, for example multi-shift applications, the manufacturer warrants to the original purchaser that the chair shall be free from defects in material and workmanship for 1 year. Normal wear of upholstery is not covered. Manufacturer liability is limited to repair or replacement of the product at the manufacturer's option. Most components can be replaced in the field by the customer. For warranty service, please Contact Us. Ships in 1 - 3 business days. Please allow for longer lead times for quantities over 50 units. Contact Us for details. Full refund of the purchase price for Kanewell chairs returned within 30 days in new, unused condition in original packaging. Partial refund for Kanewell saddle chairs once assembled and used. Try a Kanewell as long as you like. Return it in good condition and we'll refund the purchase price less a $35/month rental fee. We do not refund shipping charges. Customer is responsible for both inbound and outbound shipping charges.